SOUTH SAN FRANCISCO, Calif., & MODESTO, Calif. – July 20, 2012 –The California Milk Advisory Board (CMAB) has released a new resource showcasing ideas for how pizza foodservice operators can incorporate California specialty cheeses to increase profits and menu innovation. The brochure, “The Appeal of Real: Building Pizza Profit Power with Real California Cheese,” presents creative takes on classic pizza combinations as well as fresh flavor trends. (ARA) - The sun is shining and the smell of charcoal is in the air – it’s officially grilling season. Eighty-five percent of consumers will take to the tongs for some outdoor grilling this summer, according to the Hearth, Patio and Barbecue Association. So what’s on the menu? The California Milk Advisory Board (CMAB) has developed a host of smokin’ tips and juicy recipes that will make you say “cheese please” at your next backyard feast. So. San Francisco & Modesto – May 24, 2012 – Latin-style cuisine is on the rise. In fact, in a recent survey conducted by the California Milk Advisory Board (CMAB), nearly half of the consumers surveyed (48 percent) said they cook Mexican food at home and it’s predicted that the Mexican/Hispanic food segment will continue to grow moderately (2 percent annually) through 2016. (Mintel, 2010). So. San Francisco & Modesto – January 30, 2012 – Whatever happened to those witty cows from California? They’re busy being the life of the party from kitchens to driveways and everything in between. The folks who brought you the Happy Cows are giving you an insider’s pass to see what they’ve been up to in a pre-game YouTube preview of their Super Sunday commercial on January 30th. Whether it's preparing for a holiday gathering, watching the big game or planning a dinner party with friends and family, it can be difficult to decide what food to serve. 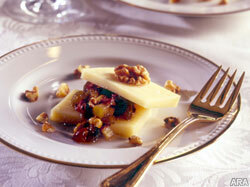 A cheese course is a simple, elegant solution that also saves much-needed kitchen prep time. The California Milk Advisory Board (CMAB) is offering party hosts, families, and cheese lovers alike an introductory lesson on putting together a first-class cheese course. Going back to school often means hitting the books for ideas to create healthy lunchbox and after-school treats that kids will love. Luckily, the experts at the California Milk Advisory Board (CMAB) have developed a host of easy tweaks and creative twists that will keep you thinking outside the traditional lunchbox all year long.